Given the implantation of the ICM at the heart of the Pitié-Salpêtrière University Hospital, the researchers dispose of inestimable biological resources: a bank of brain tissue with several thousand autopsy samples and biopsies for numerous pathologies, a DNA bank, which at present contains about 35000 samples, and an exceptional data bank that contains information on the blood and cerebrospinal fluid of hospitalized patients wishing to contribute to research. These three bio-banks represent an extremely precious source of information for research on the diseases. These biological resources are exceptional: clinical observations classified according to the type of pathology, digitalized imaging results, data concerning complementary examinations (electroencephalograms, electromyograms, evoked potentials, etc.). This activity is strictly regulated to respect patients, and 2 of the banks are certified in conformity with the norm AFNOR NF-S 96-900 (Quality of Biological Resource Centres); the 3rd is in the process of being certified. The Huriet-Sérusclat Law (n° 881138) guarantees the protection of persons participating in biomedical research. 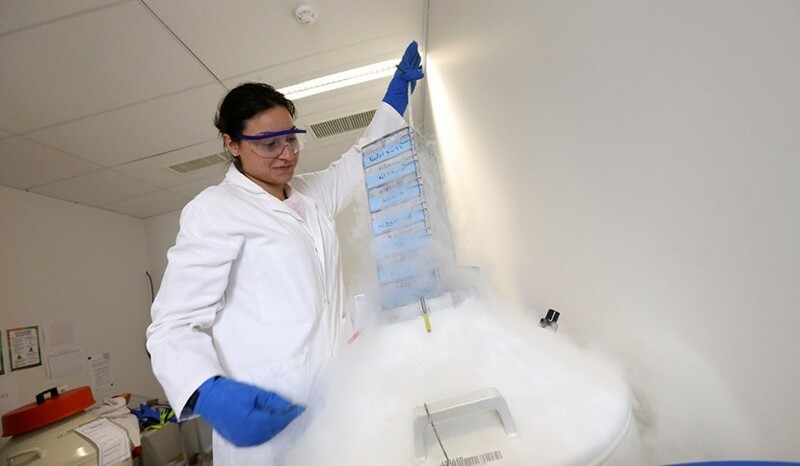 The DNA and cell bank of the ICM collects and manages the collections of samples obtained in the context of medical research projects concerning mainly neurological and psychiatric pathologies. In 2013, these collections contained biological resources from more than 43000 persons (affected patients, relatives and controls), representing about 155000 samples (DNA extracts, cells, body fluids, fibroblasts). They are among the most important collections in the world, notably for pathologies such as Parkinson Disease, the fronto-temporal dementias, autism and certain rare diseases such as the spino-cerebellar degenerations. The bank benefits from major equipment, including an automatic DNA extractor. Its system of quality control conforms to the norm AFNOR NF-S 96-900 and is certified since 2009. This resource centre is a bank of samples dedicated to multiple sclerosis, a disease with a heavy socio-economic impact. Like the other banks of the ICM, the samples are available to researchers to better understand the physiopathology of the disease, improve existing treatments, identify new curative treatments and refine the prognosis of the evolution of the handicap. During the last 6 years, the centre has distributed more than 20000 samples. The latter come from so-called simplex families (an affected child and his two parents), multiplex families (several members of sibship with sclerosis), sporadic cases and healthy subjects serving as controls to determine what is specific to the disease. The centre is also certified in conformity with the norm NF-S 96-900, specific for centres of biological resources. A national project aimed at collecting the biological resources of 30000 patients with multiple sclerosis was recently launched. In the framework of this project, the centre was designated the national research centre that will manage the DNA of the 30000 patients. The tumorotheque is a bank of biological resources specialized in samples from patients with brain tumours. It is the most important bio-bank of brain tumours in Europe, with about 10000 patients. The large number is due to its localization on the site of the Pitié-Salpêtrière Hospital. Effectively, the bank collects its samples locally, and the hospital is one of the largest European centres for the diagnosis and treatment of brain tumours. The certification of the conformity of the bank with the norm NF-S 96-900 is underway and should be validated in June, 2014. BioCollections is an association, according to the law of 1901, created in June, 2011, at the initiative of the ICM, the le foundations Voir et Entendre, FondaMental and ARSEP. Its aim is to mutualise the management, conservation, preparation, scientific valorisation and distribution of the biological samples and associated data in the field of the neurosciences. The objective of BioCollections is to federate the partners in a transparent and collaborative spirit: founding members; biological resource centres; public institutions overseeing the hospital departments and research laboratories implicated in the constitution and/or conservation of collections; patient associations. The aim is to facilitate the availability of high quality biological samples to public or private research laboratories, in order to promote the development of translational research in the field of neurological, psychiatric and sensory disorders.